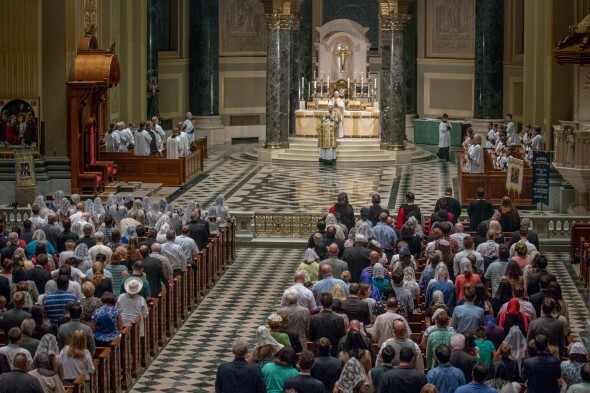 The 16th Annual Assumption Mass, sponsored by Mater Ecclesiae in Berlin, New Jersey, will take place at the Cathedral Basilica of Saints Peter and Paul, located at Logan Circle in Philadelphia, at 7:00 p.m. tonight, August 15. This Mass is a festival of praise and thanksgiving on the feast of Our Lady's great victory over sin and death. Each year, monumental music from the Church's treasury is chosen, music that cannot be used in a small parish setting. People from across the Delaware Valley travel through traffic and all types of weather to attend. Some groups that will be participating again this year: Priests, deacons and seminarians from many dioceses, the Knights and Ladies of the Equestrian Order of the Holy Sepulchre of Jerusalem, the Sovereign Military Hospitaller Order of Saint John of Jerusalem of Rhodes and Malta, The Knights of Columbus, the Carmelites of Mater Ecclesiae, the Federation of North American Explorers, Juventutem of Lehigh Valley, PA, the altar servers and Blessed Imelda Society of Mater Ecclesiae, the altar servers and Maidens of the Miraculous Medal from Saint John the Baptist, Allentown, NJ. This Mass is also meant to be a manifestation of the beauty and growth of the Traditional Latin Mass Movement. We have been given a very great gift. Help us to share and proclaim it!